Calling all little mechanics, future engineers, and kids who just like really cool stuff: World of Speed has a brand-new exhibit just for you! 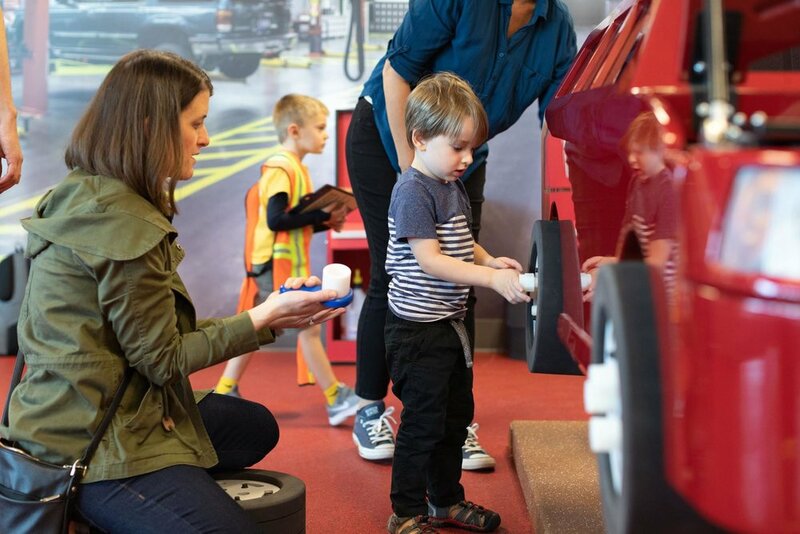 Our new Super Service Center in the museum’s Start Line Club was created by Betty Brinn Children’s Museum in Milwaukee, Wisconsin, this interactive exhibit lets children perform maintenance on a kid-sized car mounted on a lift and so much more. The exhibit’s hands-on activities encourage cooperative play and stimulate the development of fundamental skills in young children. As children select tools, replace parts, and fill work orders, they exercise skills like sorting, matching, and problem-solving. Working with other “mechanics” encourages positive social skills, and the exhibit’s activities help enhance fine and gross motor skills. So, what can kids do as part of the fun?